Editor’s note: Michael Pettis is a nonresident senior associate on the Asia Program at the Carnegie Endowment for International Peace, where this piece originally appeared. The views expressed are his own. China urgently needs to rebalance its economy, both to avoid the risk of a domestic banking crisis and to reduce its excessive claim on global demand. How it chooses to do so, however, should not be constrained by too much focus on the value of the renminbi. The exchange rate is only one of the mechanisms, and not even the most important, that will determine the price of Chinese goods abroad. It is domestic politics that will determine the form in which the rebalancing takes place, but as long as rebalancing occurs, the world should not overly emphasize the role of the currency. From July 2005 to February 2012 the renminbi rose by just over 30 percent in nominal U.S. dollars. Although the revaluation has been much less than this once adjusted for changes in relative productivity growth, the increase in the value of the renminbi has nonetheless been seen, correctly, as a part of China’s rebalancing process. 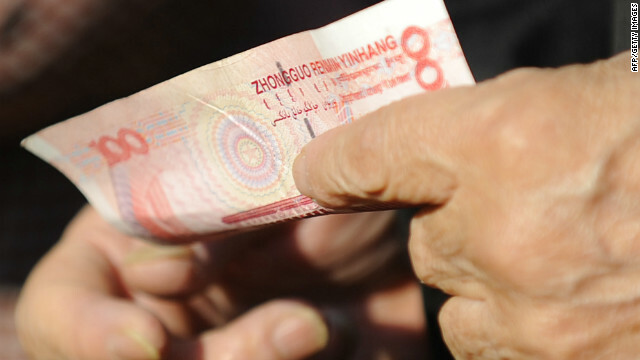 However, after rising for nearly seven years, the renminbi has dropped 1 percent against the dollar since February, setting off intense speculation about Beijing’s trade intentions. Not surprisingly, the threat of a weaker renminbi making Chinese exports more competitive abroad and foreign imports more expensive in China is raising worries in a world already struggling with weak growth in demand. But these worries may be unfounded. If China is serious about rebalancing its economy, devaluing the renminbi will not result in a net improvement in export competitiveness. China’s export competitiveness will deteriorate no matter what Beijing does to the currency. To understand why, it is important to see why Beijing urgently needs to rebalance its economy away from excessive reliance on investment towards more domestic consumption. Astonishingly high levels of investment and investment growth have powered spectacular GDP growth in China for nearly three decades, but it is becoming obvious that for many years investment has generated much less growth in debt-servicing capacity than it has generated growth in debt. As this happens, China is increasingly likely to run into the same problem that has bedeviled every rapidly-growing country in the past 100 years that has followed a similar investment-heavy growth strategy. Debt levels will become unsustainable and lead either to a debt crisis, or to a lost decade or two of very low growth as the economy and banking system grind their ways through high debt and excess capacity. As part of its rebalancing, China must sharply reduce investment, or at least reduce the rate of growth in investment. In principle, the adverse impact of slower growth in investment should be offset by faster growth in consumption, but it has proven very difficult for China to raise the GDP share of consumption. This is largely because consumption-constraining policies are at the heart of China’s growth model, and indeed at the heart of investment-driven growth models more generally. It will take many years of adjustment before consumption is significant enough to grow into its proper role. This means that during the adjustment process it is a virtual certainty that growth in China will slow significantly for many years. This is why there is now so much focus on the value of the renminbi. It is pretty obvious that if Beijing brings investment growth down more quickly than can be counterbalanced by an increase in consumption growth, its overall growth rate must slow sharply. There is, however, a third source of demand that affects domestic growth – the trade surplus. If China’s trade balance improves during the adjustment process, overall economic growth rates should be better than expected. If it deteriorates, growth will be worse. Clearly a healthy trade account will make it easier for Beijing to manage the adjustment process. For this reason, many analysts – both foreign and Chinese – argue that by boosting China’s competitiveness abroad, a weaker renminbi will provide some relief from the sharp expected slowdown associated with rebalancing. But they are wrong. If China’s trade balance improves because of a surge in foreign demand that causes both exports and imports to rise, with the former rising more quickly than the latter, this will almost certainly be good for the economy and will allow the rebalancing process to be less painful. But if Beijing takes steps to increase China’s competiveness abroad by artificially lowering costs domestically, including by depreciating the renminbi, it will have no effect on overall growth for any given level of economic rebalancing. There is a lot more to Chinese competitiveness than the undervalued exchange rate. There are in fact three main mechanisms that explain the relatively low price of Chinese exports abroad, all of which transfer income from Chinese households to subsidize Chinese producers, albeit in very different ways. The currency regime is certainly one of them, and the mechanism is fairly easy to understand. An undervalued currency spurs export competitiveness by subsidizing the local cost component for manufacturers. These implicit subsidies are effectively paid for by Chinese households in the form of artificially high prices for imported goods. Since all households, except perhaps subsistence farmers, are effectively net importers, an undervalued currency is a kind of consumption tax that effectively reduces the real value of their income. The second mechanism, the difference between wage and productivity growth, does the same thing, but with a different set of winners and losers. The wages of Chinese workers have grown more slowly than productivity for all but the last two years of the past three decades. This means that until two years ago workers have received a steadily declining share of what they produce. Manufacturers benefit from this process because their wage payments are effectively subsidized, and of course the more labor-intensive production is, the greater the subsidy they implicitly receive. The third mechanism – and by far the most important – is artificially low interest rates. These reduce household income by reducing the return households receive on their bank deposits. In China, this impact is compounded by legal constraints on investment alternatives which mean that the vast bulk of savings is in the form of bank deposits. Artificially lowered interest rates, however, increase manufacturing competitiveness by lowering the cost of capital. The more capital-intensive a manufacturer is, the more it benefits. All these subsidies spur economic growth by subsidizing producers, but they distribute the benefits in different ways. The greater the local production component, the higher the subsidy created by an undervalued currency. The more labor intensive the manufacturer, the greater the subsidy created by low wages. And finally the more capital intensive the producer, the more it benefits from artificially low interest rates. The mechanisms also distribute the costs in different ways. An undervalued currency hurts households in proportion to the value of imports in their total consumption basket. Low wages hurt workers. And low interest rates hurt households in proportion to the amount of their savings as a share of total income. Because they boost economic growth at the expense of households, these three mechanisms cause the economy to grow much faster than household income. This is the root of China’s unbalanced economy – household income has grown so much more slowly than the economy that household consumption over the past three decades has collapsed as a share of GDP. Rebalancing in China, however, means by definition that the household consumption share of GDP must rise. The only effective way to do this is by raising the household income share of GDP. Revaluing the currency is one way of doing so. It increases the real income of households by reducing the cost of imports, and it raises local production costs for manufacturers. But it is not the only way. Raising Chinese wages increases household income too, while increasing labor costs for manufacturers. Finally, allowing interest rates to rise benefits households by increasing the return on savings and raising costs for capital-intensive manufacturers. As China rebalances, the net impact of changes in all three mechanisms must result in reduced subsidies to Chinese manufacturers. An inevitable side-effect will be reduced Chinese competiveness abroad, at least initially. If Beijing wants to rebalance, and it decides to devalue the renminbi anyway, it just means that Beijing must raise wages or interest rates all the more in order to force a real increase in the growth rate of household income. Any improvement in Chinese export competitiveness achieved by devaluing the renminbi, in other words, will be fully made up for by a deterioration in Chinese export competitiveness caused by rising wages or rising interest rates. This is ultimately what rebalancing means. One way or another, as China rebalances it will lose competiveness abroad because it must raise the cost of production in favor of household income. In exchange, however, China’s domestic market will become a bigger source of demand for Chinese producers as Chinese households benefit from rebalancing. Over the long term, Chinese growth will be much healthier and the risk of a Chinese debt crisis much reduced. But over the short term, unless there is an unlikely surge in global demand, China cannot both rebalance and improve its trade performance. If China chooses to revalue the currency, it will disproportionately help middle- and working-class urban households – for whom import costs tend to be important – and will disproportionately hurt manufacturers whose production costs are primarily local, for example most manufacturers who are not in the processing trade. If China instead chooses to raise wages it will disproportionately help urban workers and farmers and disproportionately hurt labor-intensive manufacturers, who tend mainly to be small- and medium-sized enterprises. And finally, if China raises interest rates it will disproportionately help middle-class savers and disproportionately hurt large, capital-intensive manufacturers. These three strategies, in other words, have broadly the same impact on trade competitiveness, although in each case the winners and losers within China will be different. This is why the world should not be overly concerned with what happens just to the exchange value of renminbi. As long as China genuinely rebalances its economy, which will be a painful process no matter how Beijing chooses to manage it, Chinese export costs will rise and in the short term Chinese goods will be less competitive in the global markets. However, as rising domestic costs force China to increase productivity and innovation over the longer term, they will actually boost Chinese competitiveness. The path China chooses to follow should be seen by the world primarily as something that affects the way the costs and benefits of rebalancing are distributed domestically. For the sake of more sustainable and equitable long-term growth, and in the interests of economic efficiency, it is almost certainly much better for China and the world if Beijing raises interest rates than if it revalues the renminbi. However, since raising interest rates is likely to be opposed by the very powerful groups that benefit from excessively cheap capital, Beijing may instead put more focus on raising wages – which comes mainly at the detriment of economically efficient but politically weak small and medium enterprises and service industries. Ultimately, the way in which China rebalances will largely reflect domestic priorities and political maneuvering.